Willow Tree Poultry Farm of Attleboro, Mass., is recalling approximately 440 pounds of tuna salad. The product, which was mislabeled as chicken salad, contains tuna, an allergen not declared on the label. 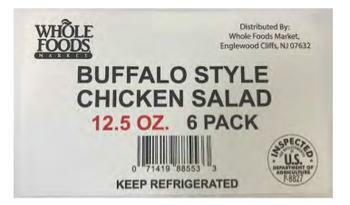 The recalled product, bearing establishment number “P-8827” inside the USDA mark of inspection, was shipped to Whole Foods Markets in Connecticut, New Jersey and New York. Consumers with questions about the recall may contact Alex Cekala, at (508) 951-8351.